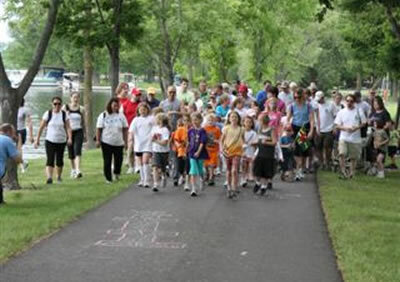 Held annually the first Saturday in June each year, Walk Wisconsin is the premier walking event in the Midwest! This is a non-competitive event, encouraging walkers of all ages and ability levels. 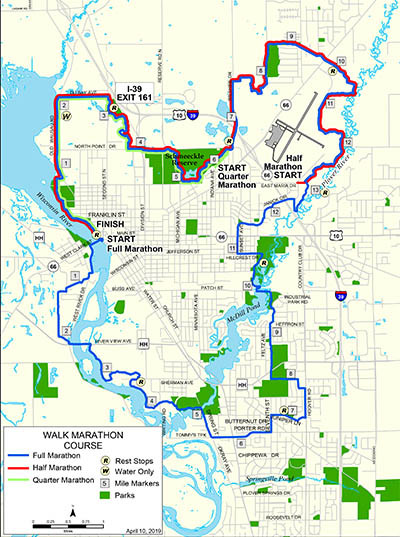 The full, 1/2 and 1/4 marathon events utilize the scenic Green Circle Trail which passes the Wisconsin River, Plover River, several lakes, and unique ecosystems. The trail base for all routes include a combination of wood chips, crushed granite, road surface and wood boardwalk. Please be at the Pfiffner Park bandshell 1/2 hour before transportation starts for your event. Comfort stops are open based on official start times and are available approximately every 3 miles. If you start earlier than the scheduled time for your specific event, there is no guarantee of food/beverages at the stops and transportation is your responsibility. No strollers or pets for any marathon event. Finish line picnic/entertainment at Pfiffner Park Bandshell: 2:00 pm – 6:00 pm. Event check-in will take place at the Pfiffner Park building, 501 Franklin Street, along Stevens Point's downtown riverfront. All registered attendees are required to check-in before walking. At check-in participants will be given a sports sack, course map, event information and participant number/wristband. Rest stops will be positioned at regular intervals along the course where nutrition, fluids, and restrooms will be available for participants. Comfort stops are open based on official start times. If you start earlier than the scheduled time for your event, there is no guarantee of food/beverages at the stops and transportation is your responsibility. Event Cost: $30.00 (Through May 20, 2019, $40 thereafter.) The registration fee helps cover the cost of the dryblend t-shirt, sports sack, refreshments and food stops along the route, the finish celebration, medallion and more. A portion of the proceeds for Walk Wisconsin will go to the Wellness Fund at the Community Foundation of Central Wisconsin. The remaining funds are used to fuel new and on-going wellness orientated activities and events to promote healthy people and lifestyles such as Kids Walk Wisconsin, Hard Rocks Hiking Challenge and Moon Walk Wisconsin. Online registrations accepted through 3pm on May 28, 2019. Call 715-344-2556 with questions. Walk Wisconsin is made possible by the nearly 300 volunteers that assist in the days leading up to the event with set-up and bag stuffing and during the actual event with participant check-in, bike patrol, intersection control, kids Walk Wisconsin, finish line celebration, award distribution and more . Please consider volunteering your time for this event. 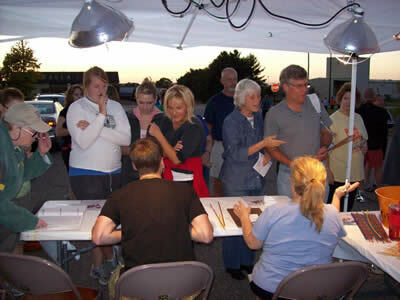 For a full list of volunteer opportunities and to register to volunteer click here. Starting with a rolling start between 7:00 AM – 7:30 AM from the Pfiffner Band shell Area (Crosby Avenue) walkers will experience eight comfort/nutrition stops along a well signed route that passes several rivers, lakes and other interesting ecosystems. The trail base for all routes include a combination of wood chips, crushed granite, road surface and wood boardwalk. Walkers will be transported from the river for a 11:00AM - 11:30AM rolling staggered start along the northern half of the Green Circle Trail. There will be five comfort stops along a route that meanders along several rivers, lakes and other interesting ecosystems. Walkers will be transported for a 12:30PM - 1:00PM staggered along the Green Circle Trail as it runs through the Schmeeckle Reserve on the University of Wisconsin-Stevens Point campus, through the new Stevens Point Sculpture Park and back along the Wisconsin River to Pfiffner Pioneer Park. There will be three comfort/nutrition stops along the way. * Always consult your physician before beginning any training program. The full marathon is an exciting and invigorating challenge. It is best to prepare according to your current physical ability. Here is a basic training plan to use as you prepare for the event. This training plan is designed for people in good physical condition or have recently started a regular walking program, looking to complete a full marathon distance walk. Looking for help in developing a successful walking plan? There are multiple ways for you to reach your goal. You can modify the posted Full-Marathon Walking Program, by walking 60-70% of the distance listed in the longer walks (8 miles or longer), and still finishing the shorter distance walks as indicated on the schedule. We have also included links to other types of training programs. Find one that you can accommodate, and enjoy the training! Want to complete the Quarter-Marathon Walk, and need help establishing a program? Since this is a shorter distance, some people will be able to train differently than others, and have different needs for a successful adventure. It is best to make a walking schedule that includes being active 4-5 times a week, by walking 3-4 times a week, and adding 1-2 days of some other type of athletic activity, like weight training, biking, physical movement classes, or swimming to name a few. If you are starting from scratch, your walking distance should start between 1-2 miles (approximately 30 minutes). Every week you should look to increase time by 10 minutes for at least 2 of your walks, and add a mile to at least 1 walk a week, until you reach 6 miles as your longest distance.